I like to think that the birds and squirrels that feed in Mars and my yard are happy – but it could well be me projecting the feeling that they give us, back onto them. We do not have a lot of feeders. And we don’t have a prize-winning array of exotic eaters – sparrows, a few goldfinches, more sparrows, a couple of purple finches, still more sparrows, one or two titmice, sparrows… What we lack in quality, we make up for in quantity. And what we do have is entertaining enough to keep us playing the game. As for feeders, there are three of them. 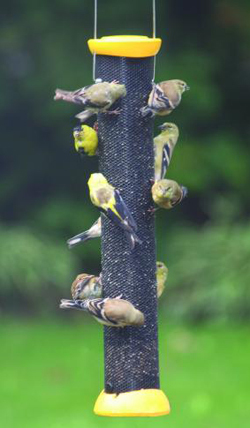 The thistle feeder is a metal mesh tube with holes small enough to keep the ultra-thin, black seeds from falling out, yet sufficiently large to allow finch-sized feet to successfully perch,and finch-sized beaks to effectively eat. Our sunflower seed feeder is an honest-to-God “squirrel-proof” dining device, constructed by me using plans and parts from the Wild Birds Unlimited store in nearby Glastonbury. The apparatus consists of a plastic “Droll Yankee” feeder with food windows and perches, safely nestled inside a green wire cage. The outer unit has openings large enough for a small bird to hop inside and is located far enough away from the inner tube to allow comfortable perching. Larger avians, such as crows and Blue Jays are not able to get themselves inside – although it is fun to watch them futilely craning their necks through the apertures in an effort to pilfer some seeds. In order to combat the wily squirrels that likewise yearn for some of the protein-packed kernels it was necessary to attached the inner feeder to the base of the outer cage – lest, as I discovered when I first put up the contraption, the rascally rodents reach in with their paws and pull the bottom slot of the “Droll Yankee” to within reach of their eagerly awaiting open mouths. Our third and least active feeder is the ceramic fish that Mars and I purchased from a potter on Cape Cod back in the day when that area was our go-to vacation spot. It was hand-thrown on a pottery wheel as a mid-sized vessel open at each end. Then the bottom was fashioned into a tail-shape with fins on the side and eyes added to the top while the clay was still moist and pliable. Unlike the other two eating establishments, the diner hangs sideways to the ground. The fish-feeder is most definitely not squirrel proof as evidenced by the bushy tail that frequently pokes out from either the mouth or tail of the Piscean stoneware eatery. We also run an intentional squirrel feeder stocked with ears of corn about fifty feet away from our triumvirate of avian cafes. This outlying food stop in no way deters the squirrels from filching the fallen seeds from or trying to break into this tripartite food court. I refill all of the dining devices every evening – rain, sleet or snow. The birds, with help from the squirrels, pretty much empty them the next day. I can hear what I interpret as chirps of joy from nearby trees on our property on those occasions when I undertake my restocking mission before sunset. Immediately next to the feeders is a bush on which the birds eagerly queue up. A few feet away are two others, for those that are one step removed from the on deck circle. And several yards off is a thorny pricker bush for those just looking to take a break and socialize.. During the growing season the sounds of anxious chirps and the perpetual rustle of the shrubs’ green leaves indicate their presence. Now, with leaves fallen and branches bare, the throng still comes to hang out and swap tweets. Even though the predatory neighborhood cats – whom, after all these years, I am certain consider the whole feeding area to be their own personal baited trap – now have an unobstructed view of their prospective prey. Still, in spite of the presence of the rapacious felines, the birds seem quite happy. Or is it just me? Not to get all philosophical however – this does not mean that the birds are experiencing ‘happiness”. The birds in our yard are happy. The cats on the other hand, for better or worse, clearly have reached that second level of joyfulness.